Give the gift of decadence when you send these indulgent, luscious Godiva® confections inspired by classic bakery treats. They’ll skip the cake and go straight for this handsome gift box featuring fine truffles in flavors like rich Black Forest Cake, Creme Brulee, Chocolate Lava Cake, Dulce de Leche, Tiramisu, and Strawberry Creme. 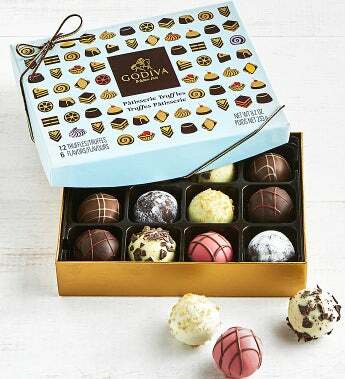 For over 80 years, Godiva® has been using only the finest quality ingredients to create chocolates and other confections that cater to the world’s most discerning chocolate connoisseurs. Gift Measures 6.75" x 5.25" x 1.75"